Everything’s [Better] in Texas | Small, but valuable. Technically, everything is bigger in Texas, but I think it’s better, too. One of my favorite people in the world is getting married this Saturday, and I have the honor of being her Maid of Honor. Redundent, I know, but it’s important to emphasize that I feel extremely privileged to stand next to this lady while she gets married. I could go on about that. I think I’ll wait until after the wedding to do that, so I can regale you with funny wedding stories that go with the “she’s so great” commentary. Anyway, back to awesomeness. 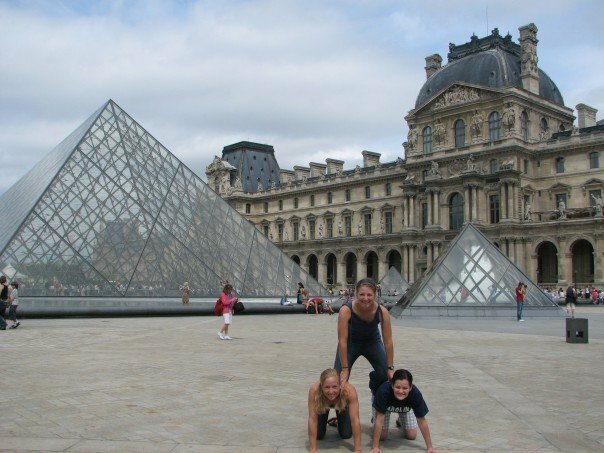 Said friend (the one on the top of the pyramid above) is getting married about an hour from where we went to high school in Texas. If seeing old friends and almost family wasn’t enough to make this weekend a thrilling prospect, I also get to show Scott around the closest thing I have to a hometown. (I love where you live, parents, I just didn’t grow up there.) Let me tell you, there’s a lot to show someone in a town with one stoplight. I hope he’s prepared for all of the bright lights and sights. Even though my blog will be quiet for the next few days, I’m sure I’ll be storing up lots of good things to tell you about. You can’t go to Texas for five days without gathering awesome stories. yay on so many levels! !